Former Iowa governor Robert Ray died on Sunday. Ray, a Republican, was widely admired across the political spectrum during his five consecutive terms as governor, from 1969 to 1983. The 89-year-old Ray died of natural causes at the Wesley Acres care facility in Des Moines, where he had lived in recent years, The Des Moines Register reported. In 2011, the Iowa Board of Regents compiled a list of some of Ray’s most notable achievements as governor, when it voted to approve the University of Iowa’s request to award Ray an honorary Doctor of Law degree. • First elected at age 40, Mr. Ray served as governor of Iowa from 1969 to 1983. As governor, he advanced human rights in Iowa. In 1973, he convened the first Iowa Conference on the Status of Women; this led to legislation creating the Commission on the Status of Women which he signed into law. By Executive Order, he declared that Iowa’s state government should be open to people for employment and appointment to public positions regardless of their race, color, or creed. • Governor Ray encouraged and actively assisted in the resettlement in Iowa of 10,000 refugees from Laos, Vietnam, Cambodia, and Thailand shortly after the withdrawal from Vietnam by the United Sates. His advocacy for refugees continued after his governorship – he served as a delegate to the United Nations Conference on Refugees in Geneva in 1979 and later as special assistant to the U.S. chief United Nations delegate. • Governor Ray was an early advocate of recycling and issued executive orders for energy conservation and paperwork reduction. He established a Task Force on Government Ethics, Science Advisory Committee, and Iowa High Technology Commission. • One of Governor Ray’s first challenges was the public outcry about student demonstrations on Iowa campuses, particularly at the University of Iowa. As a new governor, he met with newly appointed University of Iowa President Willard Boyd and Board of Regents President Stanley Redeker to agree on prompt and open communication, which proved very effective. Despite public pressure, Governor Ray never intervened during campus demonstrations, which differed from governors in other states. Governor Ray respected the integrity of the university during those difficult times. Ray was also the first governor to recognize the collective bargaining rights of unionized state employees. During his time in office, he oversaw a complete reorganization of the state’s court system, bringing uniform standards to what had been a 19-century-style patchwork of locally-focused courts, and he introduced a greater state role in the funding of Iowa’s primary and secondary schools. When asked what his favorite piece of legislation from his five terms as governor was, Ray often chose the so-called “bottle bill,” which placed a refundable deposit of five-cents on containers of soda, beer and wine to encourage people to recycle. The bill was first introduced in 1977, and immediately faced strong opposition by the beverage industry and grocers. After Ray threw his support behind the bill, it passed both chambers of the Iowa legislature with bipartisan majorities. Ray signed it into law in 1978. The bottle law still faces opposition from the beverage industry and grocers, and in recent years Republicans in the legislature have attempted to repeal it. But the forty year-old law remains popular with the public. In January, a poll conducted by the Register found 57 percent of Iowans surveyed favored either keeping the law as is or expanding it. 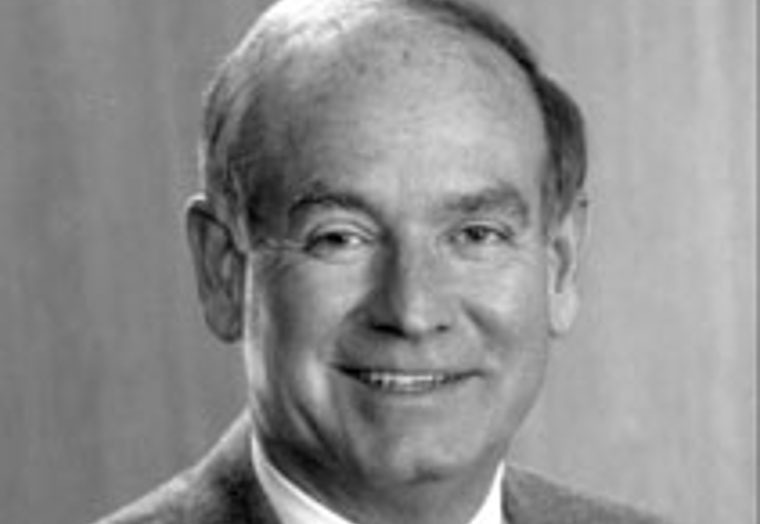 A native of Des Moines, Ray moved to Cedar Rapids after leaving the governor’s office in 1983 to take the job of CEO of the insurance company Life Investors Inc. Six years later, he became president and CEO of IASD Health Services Corp., and oversaw the series of mergers and expansions that transformed the company into Wellmark Blue Cross and Blue Shield. Ray remained active in public life—even serving as interim mayor of Des Moines in 1997– until his health declined. He is survived by his wife Billie Ray, their children and their families. Details on memorial services for Robert Ray have not yet been announced.